I wonder how many recipes there are for potato salad. Hundreds? Maybe thousands? At least. It seems that every culture, every country, every cuisine has some sort of salad, hot or cold, based on potatoes. And, of course, every cook puts his or her special touch on the recipe. That’s what I’ve done with this recipe. I’ve tweaked it and tweaked it until it perfectly suits our tastes. Try it and maybe it’ll suit yours as well. Prepare the potatoes by cutting them into bite-size pieces. I like to use a waxy, red-skinned potato, but you choose whatever you like. I just like the way the waxier potatoes retain some “bite” after they’ve cooked instead of becoming more like a mashed potato texture. 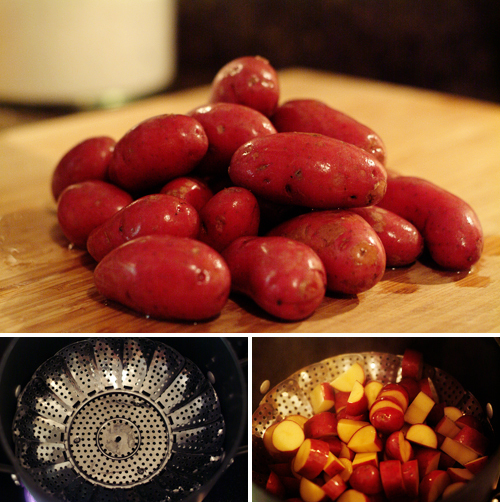 Put the potatoes into a steamer basket over boiling water and cook until fork tender. Steaming is another thing that I do differently. Again, I prefer the texture you get from steaming instead of boiling. 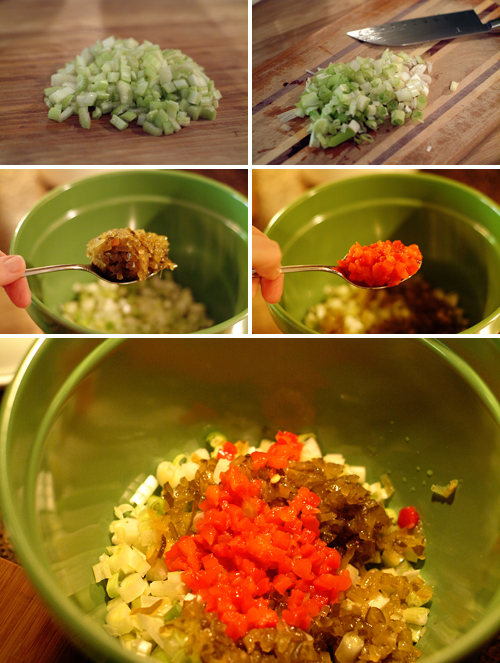 Chop the celery and scallions and add them to a large bowl along with the sweet pickle relish and pimiento. Again, the sweet pickle relish is a personal thing. Some folks use cubed sweet pickles or even dill cubes. I like the bit of sweetness the relish adds as a contrast to the scallions. In a small bowl, mix the mayonnaise, mustard, salt and pepper. Combine drained, cooked potatoes in a large bowl with celery, scallions, pickle relish, and pimiento. Make sure that you drain the potatoes very well. You can even return them to the hot pan for a few minutes to allow all the water to evaporate. You want them quite dry but still warm. Combine the mayonnaise and potato mixtures and toss until well combined. Spoon into a serving dish and dust with paprika (if desired). Steam the potatoes over boiling water until fork tender. Combine cooked potatoes in a large bowl with celery, scallions, pickle relish, and pimiento. 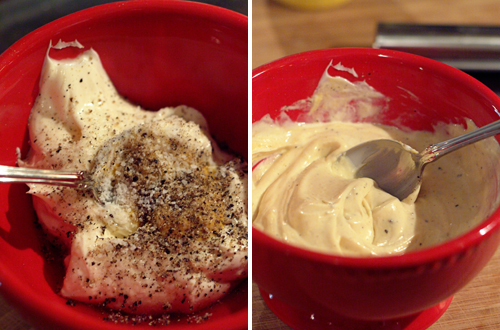 In a small bowl, mix the mayonnaise, mustard, salt and pepper. Pour over potato mixture and toss until well combined. I love potato salad. I think my grandmals is the best ever and she adds pickle juice! Yum! Lovely potato salad. It’s been a while since I’ve had some. I love the dusting of paprika on top. What a great idea to include the chopped pimento. This salad is so beautiful! That’s great that you put your special touches with this recipe! It looks really great and the best part is the dusted paprika… lovely! Tummies rumbling for this. Who says no to tater salad?